Over the last year, we have lived in a 20'x8' shipping container while transforming it from an empty metal box into a bamboo-floored, solar-powered, insulated, portable home that our friends with apartments visit enviously. 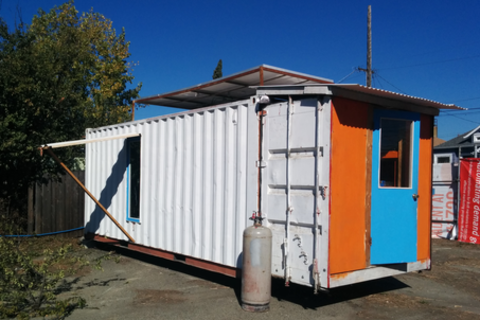 Recently, we've expanded into a container-based community; we're now able to live in the heart of West Oakland for several hundred dollars a month with chickens, gardens, community, and even a toilet:) This session is a crash course in why and how we built our post-apocalyptic utopia, covering the construction, expansion, and maintenance of all our major subsystems. We'll share mistakes we made, including the generator fire. Participants will leave convinced that building their own container house is easier, cheaper, and less crazy of an idea than they thought an hour ago. I have lived in many countries in a variety of housing situations which gave me good perspective on the possibilities of shelter and community. I graduated with a degree in art and went to work on a horse farm, living in a horse stall which had been converted into a tiny apartment. Since that time I have been a professional equestrian, web developer, studio manager and builder of tiny houses and janky couches. Frustration with rent prices in San Francisco and disappointment with current action towards climate change caused Luke and I to create Boxouse, proactively designing the lifestyle and community we would like to participate in.